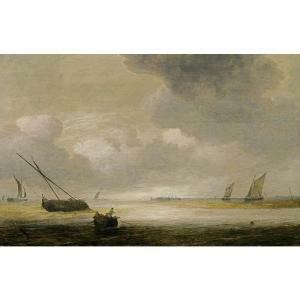 Find artworks, auction results, sale prices and pictures of Hendrick Van Anthonissen at auctions worldwide. monogrammed at lower right (on a piece of driftwood): H. V. AN. After his apprenticeship under his father, the marine painter Aert Anthonisz., Hendrick van Anthonissen became a student of Jan Porcellis, in whose studio he worked between 1624 and 1626. He adopted Porcelli\’\’\’\’s monochrome palette and atmospheric effects, produced by water and the sky. Limiting himself exclusively to brown hues, Anthonissen managed to create sensitive interpretations of events on and off the Dutch coast. 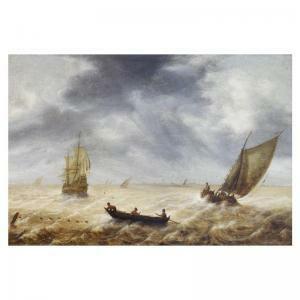 The present painting is datable to the period around 1656 and may be compared to a composition in the Marine Museum in Greenwich painted around the same time. Minneapolis, The Minneapolis Institute of Arts, Toledo Museum of Art, and Los Angeles County Museum of Art, Mirror of Empire: Dutch Marine Art of the Seventeenth Century, 23 September-30 December 1990, 27 January-28 April 1991, 30 May-1 September 1991, no. 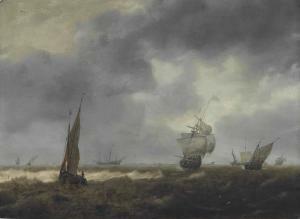 1.
formerly attributed to jan van de cappelle, the attribution to anthonissen was first suggested by ineke wansink in 1995. a comparable work by the artist, signed and dated 1651, was sold dordrecht, mak, 6 september 1999, lot 14. provenance with d.a. hoogendijk, amsterdam, where possibly bought by jaffé by 1958, from which collection bought by the present owner around 1995 (the last two according to oral information from the present owner). exhibited laren, singer museum, kunstbezit rondom laren, 3 july-31 august 1958, p. 24, cat. no. 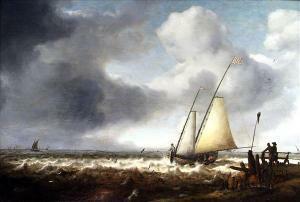 79 (as by jan van de cappelle). literature beeldende kunst, vol. 24/no. 53, cat. no. 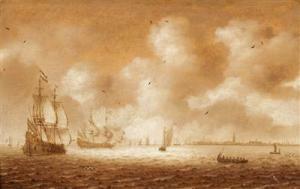 7, reproduced (as by jan van de cappelle). , April 19-May 27, 1990, no. Conditions and Buying at Auction guide.